When Insomniac Events announced the addition of a Trance based festival to their brand last year, they probably didn’t anticipate the demand their new event would incur among dance music fans. Dreamstate has already enjoyed two successful events in California, as well as a number of standalone festivals and the recent announcement that the San Bernardino show would be receiving two additional stages this year. Now, Insomniac is gearing up to bring the Trance festival to the east coast. This fall, Dreamstate will see its debut event in Brooklyn, New York. For its first event, the Brooklyn edition will feature a single stage, similar to the original San Bernardino incarnation. 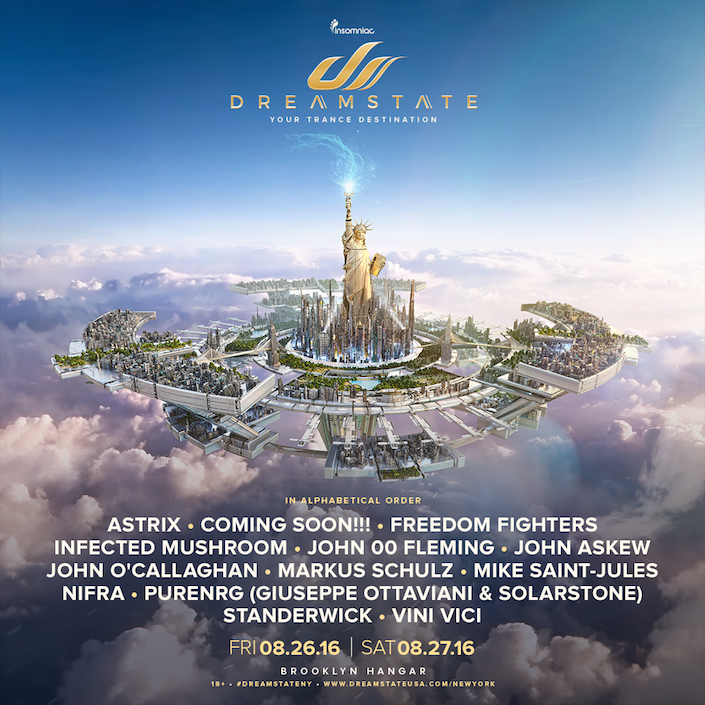 A number of DJs for Dreamstate New York have already been confirmed, with major talent like Markus Schulz, Infected Mushroom, John 00 Fleming and Astrix slated to perform. The festival will kick off August 26 and 27 at Brooklyn Hangar, and tickets go on sale Friday, July 8 at noon PST.